I am sitting at the library right now trying to figure out why my calendar on my iPhone doesn’t match my calendar on my MacBook. I pay $100/year for this ridiculous Mobile Me account that is supposed to sync my calendar among other things and all of a sudden there seems to be a problem. Why? I don’t recall doing anything different. I love technology except when it suddenly throws you for a loop like this. I am considering switching over to Google calendars all together and discontinuing my Mobile Me account. OK I just had to get that off my chest. It was a miserable rainy day outside, but that didn’t stop us from having an extremely full day. I did my usual gym workout while Carlos was at school. Today I did some speed training on the treadmill, the arc trainer and upper body strength training. After picking up Carlos from school we made a Costco run, then to lunch with my Mom and my aunt. I somehow convinced Carlos that we should go to Whole Foods. By the time we got there he was quite restless. I only managed to pick up nutritional yeast and chia seeds. Maybe that’s the trick to shopping at Whole Foods…take a cranky, restless toddler with you and you will spend so much less money. I have made mention to our mommy/son dates. We were supposed to have one a few weeks back. 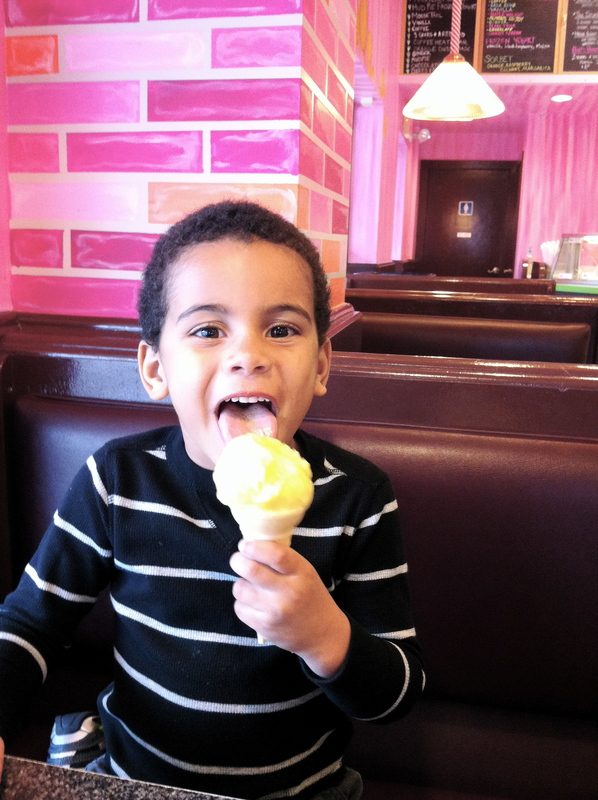 He has been dying to get ice cream at Bart’s Homemade, a local ice cream shop. We went there once a year ago and he apparently has not forgotten that. We tried to go on Sunday after our hike, but it was closed when we got there. Since he has been so good over the last few days I surprised him with a visit to Bart’s this afternoon. He was thrilled. He had orange sorbet on a plain cone. I had a kids size scoop of coconut sorbet. It was delish! 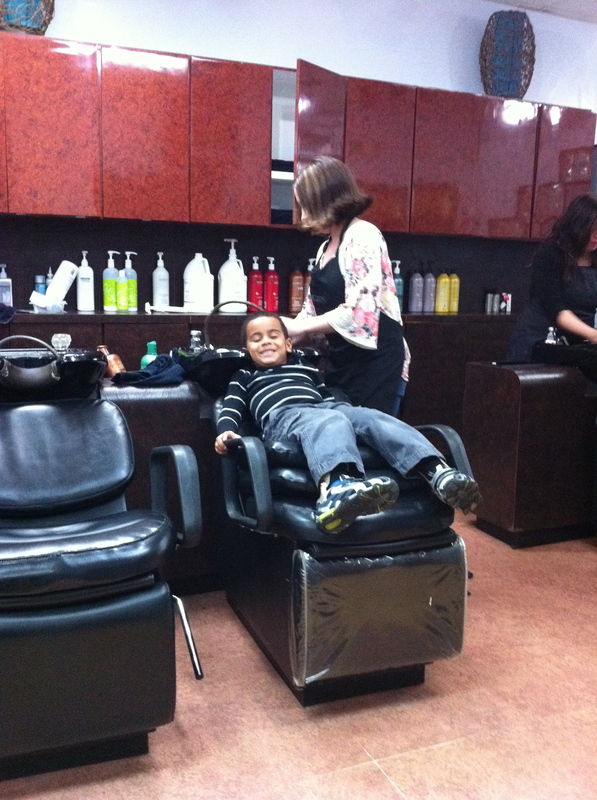 Then I swooped Carlos into the hair salon next door for a quick haircut. He was so good, sat still through the entire cut and even got a shampoo at the end. We didn’t get home until almost 4 o’clock. Time to make dinner. I whipped together a quick dinner of brown rice spaghetti with sauteed onions, spinach and tomato sauce. Somedays I’m just not creative and simple pasta is the best that I can do. The days go by so quickly. I never feel like I accomplish enough and there are always 8,000 more things that I need to do. Now I am sitting at the beautiful Mount Holyoke College library feeling completely overwhelmed by this MobileMe/iCal issue. I just realized that my MobileMe email is not working either. Grrrrr time for a coffee. This could be a long night! Hope you got your MobileMe issue worked out!